1. Those that do not understand the importance of employer branding, and therefore don’t prioritize or fund it at all. 2. Those that understand the importance of employer branding, but don’t know how to prioritize or build it into their budget. For this blog post, we’re going to focus on the latter. Budgeting season is upon us, and with it, we always receive an influx of questions on how to build an employer branding budget. According to LinkedIn, companies with a strong employer brand see a decrease of 43% in cost per hire and as revealed by their Global Talent Trends 2017 study, 53% of recruiters said employer branding would be their number one priority if money wasn’t an issue. It seems like leadership agrees it is important and something to consider, as 80% of leaders agreed that employer branding has a significant impact on the company’s ability to attract quality talent. 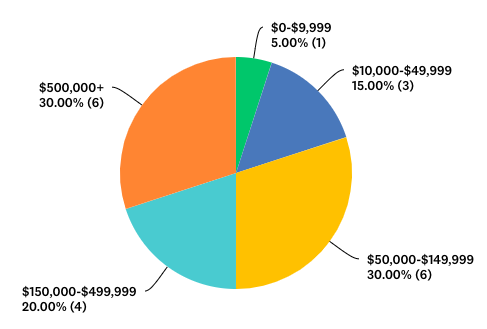 Only one company with between 1-499 employees participated in the survey and their overall employer branding budget was between $50,000-$149,000. They spent the largest amount (75-100%) of their budget on staffing, and the least amount (0-9%) on technology/tools and consultants/agencies. As you would imagine, we found the company employee size was directly related to the size of the employer brand budget, as a whole. The bigger the company, the bigger the employer brand budget. Now that you know how other companies are dividing up their employer brand budget, we’re going to share some tips on how you can prioritize each of these areas. The headcount you’ll need to build and execute on your employer brand strategy is definitely something to think about when planning out your budget. Do you currently have a person or team dedicated to recruitment marketing and employer branding? Maybe you partner with marketing (when they have the time or resources to do so) but it’s not enough or they lack an understanding of recruiting? You will want to analyze how many and what kind of staff you currently have and then how many and what kind of staff you still need to support these efforts. Minimally, you will need someone with experience in content marketing and social media management, and at best, someone strategic who understands talent branding and recruiting and can help build and execute a multi-channel strategy. This could be someone internally, wanting to grow in the field of talent acquisition, or a consultant/freelancer to help you get started. We’ll cover more about budgeting for outside help from consultants or agencies in a later section. Focus on major job boards like Indeed, Glassdoor, and LinkedIn first, as well as programmatic advertising to manage the media dollars for your digital job advertising campaigns. This allows you to manage advertising spend on your largest investments and track its effectiveness. If you do a lot of niche job board advertising (i.e. nursing specific job boards, diversity job boards, etc. ), you can combine all of them into one “niche job board” bucket since you’ll likely be managing them manually. Content is the fuel that feeds the flame of your entire employer branding strategy. There are many types of content you will need to create in order to generate traction with potential candidates: video, copy for blogs, email templates, marketing collateral for events, career site content, and advertising campaigns, to name a few. Whether it’s employee generated content or professional quality video production from a firm like Proactive Talent, it’s all important to include in your budget in order to appear attractive to candidates. Social media is now “pay to play’…but a little can go a long way. Although social media is free, you will need to spend a little money to ensure that your specific target audience sees your content. Even just $20 to boost a Facebook post could get you 1,000-10,000 extra sets of eyes on your content. Think about how much of your overall budget you can devote to making sure that content you spent both time and resources on making is actually seen by the right people. Establishing a specific budget for the tech stack you use is very important – it helps you understand what parts of your strategy you can automate and make more efficient and what parts you may have to do the old-fashioned (manual) way. Your recruitment marketing and employer branding tools are the vehicle that you’re driving but your employer brand strategy is the road. Determining the amount you can devote to these tools can help you know whether you’re going to be driving a Tesla or a Toyota. The tech you use can give you opportunities to automate, and most importantly, measure the effectiveness of your recruitment marketing and employer branding efforts, from candidate source, to hire, as well as how it affects your overall recruiting KPIs. If you don’t have the right tech, getting accurate metrics can be a very manual and daunting process. Items to include in this portion of your employer brand budget would be tools that you regularly use to execute your recruitment marketing and employer brand initiatives. Some examples are: employee amplification tools such as ContentApp, QUEsocial, or LinkedIn Elevate, social media management systems like Hootsuite or Sprout, CRMs and recruitment marketing platforms like Avature, Clinch or SmashFly. We recently published a whitepaper with a list of 50 tools worth checking out. If you’re interested in taking advantage of new artificial intelligence tools and automation, like chatbots, download our recent whitepaper on AI technologies for recruiting. Employer branding as a profession has only been around for about a decade or so. Most organizations do not have employees with the employer branding skillset needed to attract today’s talent, and unfortunately, there are not enough professionals with employer branding experience in existence for every company to easily hire someone with that kind of expertise. However, we all need outside help at times and it’s always a good idea to reserve some of your budget for this. Leveraging an employer branding consulting firm to help build your strategy and then execute on it can help you move the needle a lot faster, all while getting excellent results. Not everything can be done from behind a computer. Recruiting events are still a great way to get face-to-face time with potential candidates and recruit great talent. Creating a successful event not only takes time, but also money. Whether you’re doing an open house at your office or a career fair, there will be costs involved. When planning recruiting events, you’ll want to make sure that you have impactful branded material and collateral (see “content” section above). Plus, there are always obvious event costs such as booth space, refreshments, and SWAG. Consider your budget constraints ahead of time and that will help you figure out how many events you can do per year, and how to prioritize them. Allocating money to a specific initiative makes it easier to track and therefore prove ROI. The key to good budgeting is to start with a specific dollar amount and then track exactly where it goes. 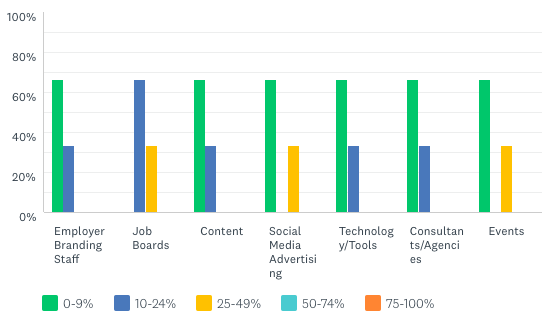 To do this in regard to recruitment marketing and employer branding, break down each category of your spending and then track the source of hire for each new employee. For instance: referrals, job boards, employer branded content, events, etc. If all of this is sounding a little overwhelming, or maybe you just don’t have the time to take on a project like this yourself, please consider letting us partner with you. By hiring Proactive Talent, you can eliminate the headache of putting together an employer branding budget from scratch, and instead have our consultants utilize their decades of employer branding experience to help. Older PostProactive Talent Moves to New HQ, Launches New Recruitment Media Services, and Brings On an Impressive New Team!